How Did Stanton/Eastbanc Get Away With Vinyl Windows In the Hine Project? 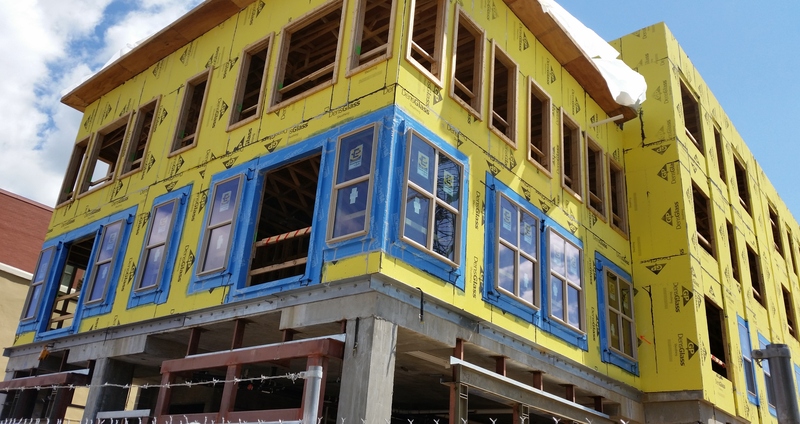 Vinyl windows are being installed in the Hine project’s North Building, which contains most of the project’s affordable/workforce housing (34 of 46 units). Mayor Muriel Bowser publicly expressed her disapproval of the segregation of these units in a separate building, but approved the project despite her reservations. Buwa Binitie of Dantes Partners – who managed the Hine project’s affordable housing component – said that the reason for the segregation was that it was not feasible to combine low-income housing tax credit (LIHTC) financing with conventional lending, so a stand-alone component with separate LIHTC financing was created. One of the reasons Stanton Eastbanc was awarded the contract to develop the Hine site was that they proposed providing an amount of affordable housing far in excess of what was (then) required. (Under today’s regulations, Stanton Eastbanc would fall short of the requirement for affordable housing in a project developed on public land). As previously reported here on CHC, the separation of all LIHTC units into a distinct building and legal property allowed the project to qualify for the tax credits; if considered as one project, the Hine development falls short of LIHTC requirements. The North Building is being constructed more cheaply – primarily of wood according to Type III Construction standards. Hence the vinyl windows. You won’t find vinyl window in the South Building built with conventional financing and constructed of steel according to Type I Construction standards. According to the National Fire Protection Association, structures are divided into five construction types for the purposes of firefighting, and are listed from least combustible (Type I – high rises) to most combustible (Type V – most recent single-family homes). Most city rowhouses are Type III. The lower-grade building materials used for the stand-alone LIHTC building underscores the objections raised by many residents to segregating the majority of units in the first place. Three of the 17 non-senior units will be reserved for households earning less than 30% of the AMI and 14 units are reserved for households earning less than 60% of the AMI. With respect to layout, retail space for the North Building will be located on the first floor and in the basement. The building will be four stories, and step down to three stories on 7th and 8th Streets. Except for two units facing 8th Street, the residences will be located on the second, third and fourth floors. Entrances to the retail will be on 7th Street and on the newly re-opened C Street between 7th and 8th Streets. 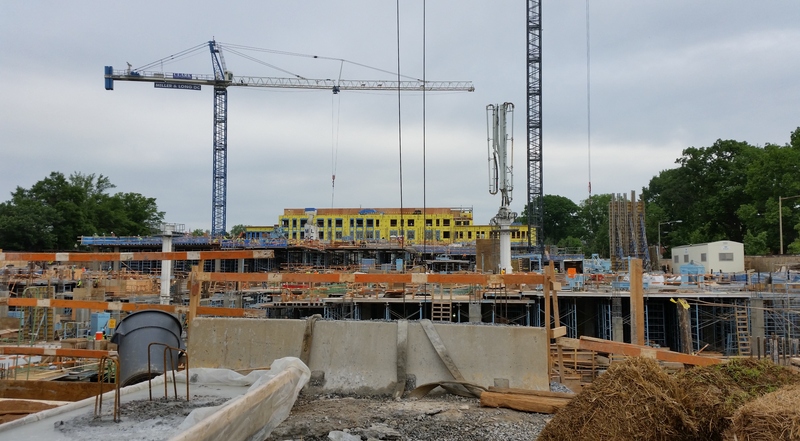 Entrances to the residential units and the main lobby will be on 8th Street and C Street. Developers expect to complete construction on the North Building this fall. Eastbanc principal Anthony Lanier did not respond to a request for comment on this posting. Could it be that Stanton Eastbanc knows “people in high places”? Affordable housing tenants pay below market rates, so why should the housing be built to the same standards as market rate housing? Affordable housing should be safe, clean, and comfortable, of course, but it’s hard to argue that vinyl windows detract from its overall utility. More to the point, isn’t the overall appearance of a structure what matters most in an historic district? Building materials change over time because many older materials simply aren’t as good as newer materials. Wood cracks or warps, is prone to leaks and termites, and requires frequent painting. Materials with such high maintenance costs seem counterintuitive for affordable housing, do they not? John, your argument is certainly logical (“isn’t the overall appearance of a structure what matters most in an historic district? Building materials change over time because many older materials simply aren’t as good as newer materials. Wood cracks or warps, is prone to leaks and termites, and requires frequent painting”). Apparently, though, you have never attempted to (legally) install newer-material windows in a historic-district building. Historic Preservation, as encoded in law via Historic Districts, has different standards for historic buildings vs. non-historic buildings. The rules for Historic Districts will vary depending on the structure. Some rules are universal, but others apply only to contributing historic buildings. I understand the reaction against this when owners of historic homes must install wood windows, but it really is a different situation. The Hine buildings were obviously not contributing structures (and in the case of the north building, there was no structure there previously). Are you trying to use facts and logic on an Internet comment? I think it’s a little misleading to compare the Type III materials as lower grade than Type I materials. That suggests one is better than the other, and that the people in the North Building are somehow being treated unfairly compared to those in the south. Building construction types are tied to fire resistance, which in turn is tied to use. As your photos show, the bottom, retail, floors are concrete in the north building. The Type III materials don’t start until the second story, where residential starts. I can’t speak to the use layouts in the south building, but I imagine space uses determined the structural materials used. Maybe your next article should be about why homeowners in the historic district are required to purchase more expensive and less energy-efficient wood Windows when vinyl looks the same and requires far less maintenance, especially in our climate. 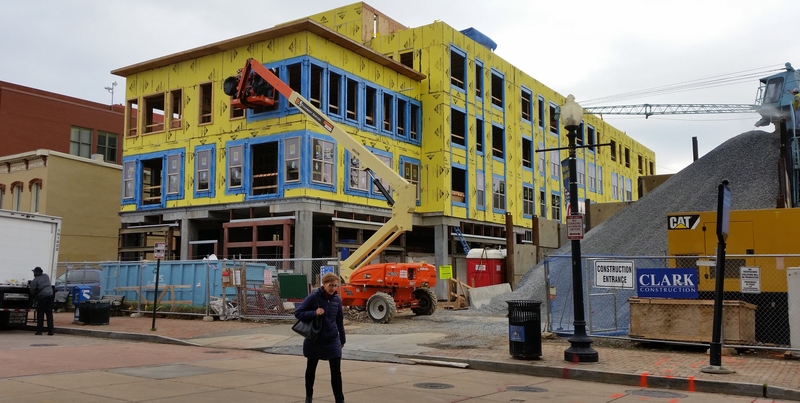 This is an interesting comment: “Isn’t the overall appearance of a structure what matters most in an historic district?” It is indeed true that outward appearance–most specifically, facades–seems to trump everything else in historic preservation in DC. This results in what are, to me, simply ridiculous excuses for historic preservation: i.e., leaving the outer layer(s) of brick of a building (the burnt-out shell of Frager’s being a prime example) while everything else is completely replaced. To me, this is exactly what Disney and Las Vegas are famous for. I think this problem with this development lies in the apparent differential of what constitutes “historic.” When our neighborhood’s Stuart-Hobson Middle School was renovated in the last few years, the city replaced its vinyl windows–which were in poor condition and not original to the 1930s building–with more vinyl windows! I asked why this could be so, given that there was HPRB review of the school’s addition. I never got an answer. And yet, that school building IS historic by any measure, and in the historic district, while its windows are clearly not appropriate if one follows historic guidelines. Moreover, to save money, the city simply pasted plastic panels *over* original wood trim on the outside of doorways, rather than repairing and caring for that original wood trim, which is lovely (and historic). Again, no one seemed concerned. To me, such odd exceptions like that school and this development inevitably give the impression that the rules don’t apply overall–and I cannot ignore the class element of those exceptions, which is disturbing. Curious to know if any of the units have been sold? The Windows are actuality aluminum and made by Pella so they are not cheap. I agree that they should have picked a style that is in more fitting with the neighborhood.